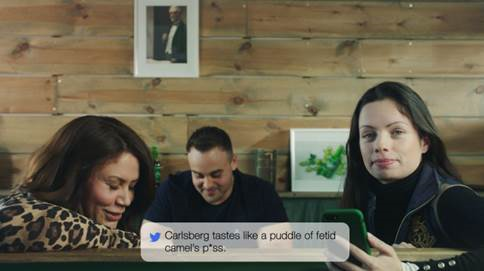 Carlsberg has marked the launch of its new Carlsberg Danish Pilsner in UK by sharing some of the meanest things people have tweeted about its old beer in a bold, honest and witty way. Created by Fold7, Clifford French and Initiative, the video series captures the reactions of employees across the business, from the brew house to the finance floor, which are a mixture of shock and bemusement as they read out the colorful descriptions used to describe the old brew. The new Carlsberg Danish Pilsner (3.8% ABV) retains the light, refreshing qualities of its predecessor but with a smoother, fuller mouth-feel and a perfect balance of bitterness and sweetness. Distinctive citrus and floral hop aromas deliver greater depth of flavour and a hoppy moreish aftertaste. Carlsberg UK brews and sells premium quality beers, including Carlsberg Pilsner, Carlsberg Expørt, Poretti, Grimbergen, Celia and Tuborg, as well as holding the UK brand licence for San Miguel, Mahou and the Brooklyn Brewery craft beer portfolio.